Our talented staff design bespoke security gates that are perfectly matched to the security requirements, location restrictions and aesthetics of your property. 1st Choice Security Systems have installed electric and automated gates on a wide range of properties throughout London including car parks, offices, hotels, factories, warehouses, public buildings and private residences. We can design and install any kind of gate including driveway gates, entrance gates, garden gates, estate gates and park gates. We also specialise in designing and installing automated gates in London, which have a high-level of security and provide easy access for authorised users — particularly important in high-traffic commercial locations. Our security consultants and installers will consider client requirements, security risks, safety issues, traffic levels and location constraints before recommending which type of electric gate should be used. After the initial consultation our designers will create the electric or automated gate design that is attractive, secure, durable and efficient. Every electric gate in London which has been installed by 1st Choice Security Systems is reliable, quiet and extremely safe. Because we are a “full service” security company, we can also integrate your electric gate with other security infrastructure you may already have. Contact us today on 0800 118 2414 to learn more about our electric gates, or read on to learn more about the benefits of having an electric or automated gate in London. Our CAMESAFE Installers have the experience and knowledge gained from training to be able to offer the required security solutions and automation safety to all our electric gates in London. Many incidences of burglary, trespass, arson and vandalism can be avoided by installing an electric gate. 1st Choice Security Systems can also advise property owners on additional security infrastructure that can help them avoid specific types of crime. The most popular choice for residential gate installations in London, swing electric gates operate like a door, swinging inwards to provide access. They can use a variety of opening mechanisms including hydraulics and electric motors. Most home owners in London choose automated swing gate systems, which can be paired with a variety of access control mechanisms including remote controls, vehicle tag readers and wireless sensors. It is also common to see sliding electric gates in London. These gates slide a panel along the fence line to create an opening. The can be configured to use a track system with rollers or wheels. They are one of the most cost-effective types of electric gates in London and are ideal for locations with steep driveway inclines that make swing gates impossible to use. A common sight in car parks and industrial locations around London, the electric barrier arm gate is an articulating gate that swings at an angle to form an opening. This kind of gate usually works in conjunction with other security infrastructure including CCTV, traffic spikes and access controls to create a secure entry point. It is a great low-cost option for commercial locations in and around London. It is also useful for installations with limited horizontal or vertical space. Similar to a sliding electric gate, cantilever gates move a panel horizontally to form an opening. The key difference is that the gate is cantilevered off the fence and it does not touch the ground. This type of gate is ideal in locations where there is rough terrain that is unsuitable for gate rollers or it is impossible to install a track system. This type of electric gate operates similar to a garage door, lifting vertically to form an opening. It is particularly useful for installations where there is insufficient horizontal space for a sliding gate and the entrance is too steep for a swing gate. A very interesting and attractive gate design, bifold gates have multiple hinges which collapse to form an opening, similar to an accordion door. They are very useful for properties with severe space restrictions. Every electric gate in London designed by 1st Choice Security Systems has the option of using different opening mechanisms including electrical operators and hydraulic operators. We can also install backup power sources for opening mechanisms including backup batteries and solar panels. Criminals usually look for the easiest possible target. The mere presence of an electric gate will warn the criminal that the property owner has security measures in place. Electric gates are useful for stopping a crime occurring in the first place. Electric gates are the perfect way to keep nosey neighbours and door knockers out of your property, giving you and your family a greater level of privacy. Home owners can decide who is allowed to reach their front door and can restrict access very easily. Sometimes people will trespass onto a property with the intention of damaging the building or its contents. An electric gate will keep those people off of your property and reduce the risk of costly damage occurring. Unfortunately, London has a bad track record when it comes to civil unrest. Many home owners installed automated gates in London after the most recent unrest, to protect their homes and businesses. Electric gates are a very effective way to keep people away from your property when an incident does occur. CCTV cameras can act as both a security measure and a safety feature. Operators can use the camera system to prevent accidental or injury. These are magnetic field generators that can detect metal above them. They can be used to make a gate open or to prevent it from closing when there is a vehicle present. Warning signage around the gate can be used to warn people of the gate’s opening action. We can install warning sounds and warning lights, which activate when the gate is in use. Our experienced designers can precisely match the design of the electric gate to the aesthetic of your property. We can craft a gate that is both stunning to look at and adds a great deal of security to your property. In addition to designing and installing electric gates in London, we also specialise in performing gate repairs in London. 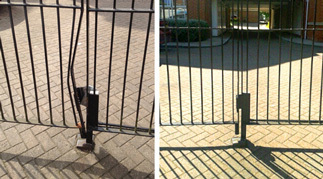 We can repair any kind of gate and opening mechanism, improving its performance, reliability and aesthetics. Why Choose 1st Choice Security Systems for Electric Gates in London? 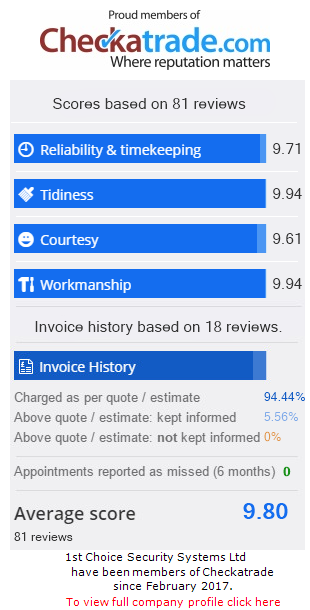 Our high level technical skills, vast experience and value for money have made us the leading provider of electric and automated gates in London. The 1st Choice Security Systems team provides a level of customer service that exceeds our competitors — we won’t be happy until you are! All gate installations are performed professionally and efficiently. We are very experienced with working in commercial environments and understand that the work must be completed quickly to minimise interference with business operations. All installations are performed in-house by our highly qualified staff who take pride in their work.